A new coffee pot can be a relief for coffee lovers who depend on a strong cup of joe each morning, but when the coffee pot has that "new appliance" smell, it can make the fragrance taste of the coffee less than desirable. A good washing and a cycle of vinegar through the coffee maker and coffee pot, however, can strip the "new appliance" smell from the coffee pot for good. A coffee aroma should be the only smell your coffee pot emanates. Mix a soap solution using 1 tsp. of liquid dish detergent and 1 gallon of hot water. Use a soft sponge to wipe down the coffee pot and coffee maker inside and out with the soapy solution to wash it. Rinse away any soap residue by wringing out the sponge in clean water and wiping it over the coffee maker and pot once again. 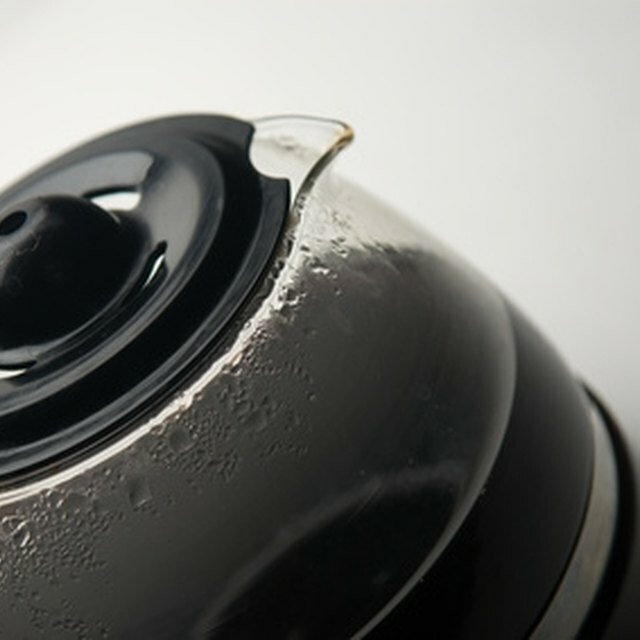 Fill the water reservoir in the back end of the coffee maker with 2 cups of distilled white vinegar. Make sure the pot is in place at the front of the machine and turn on the coffee maker. Wait 15 to 20 minutes for the vinegar to cycle through the back of the machine, through the filter basin and into the pot. Pour the hot vinegar from the pot down the drain to empty it. Replace the coffee pot at the machine. Fill the water reservoir up to the fill line with clean water. Turn on the coffee maker and allow the water to cycle through the machine and into the pot to rinse any remaining vinegar away. Pour out the cycled water when the pot is full. A vinegar rinse can also be done anytime you're noticing heavy coffee stains on the coffee pot that don't come off with washing. Any liquid that comes through the coffee maker will be hot, so use caution when handling to avoid burns or scalding.